Put yourself in two scenarios. Scenario one: picture lunch time during your high school days when food was served as routine. Monday was Taco Day, Tuesday was Pizza Day and so on. Now, put yourself in scenario two. It’s date night with your sweetheart, and you are headed to your favorite restaurant. That ribeye steak is calling your name along with your favorite sides. Which type of dining sounds more pleasing? Most likely, the nice restaurant-style sounded the best. It just so happens that Century Park facilities feel the same way when serving their residents. 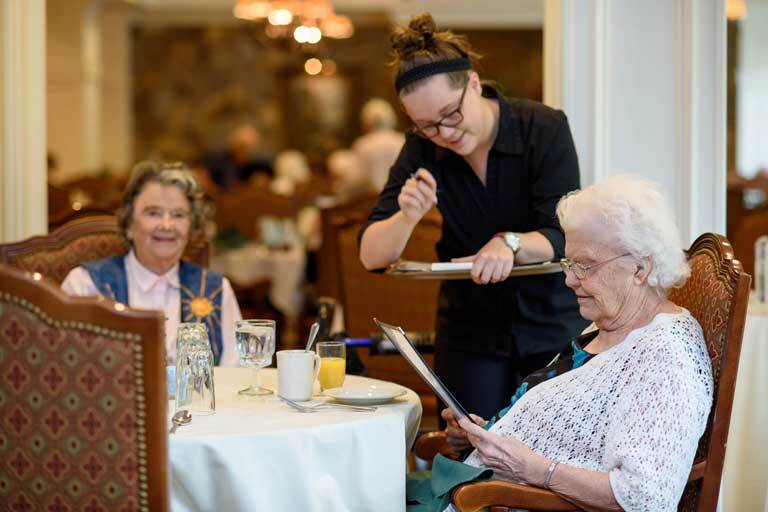 One community, Garden Plaza of Greenbriar Cove in Ooltewah, Tennessee, shows an example of Century Park’s culinary teams that strive to step up retirement living dining by cooking to order. This is the question Bradley Marks, the executive chef, and the culinary team ask themselves every day. According to Chef Bradley people eat with their eyes, and presentation is everything when you display your product to the consumer. Food keeps everyone happy and is a big part of the residents’ socializing hours of the day. So what are the ingredients to making this dining experience so grand? The first ingredient to making a restaurant-style experience happen is having an open-minded and dependable culinary team. There are around 25 members on Chef Bradley’s culinary team, and they are encouraged to be open and creative. Ideas are always welcome, and the team will help perfect the dish once it is presented. Chef Bradley believes the kitchen team leader has the staff to work well and that communication is important. The staff has to listen to the residents, get to know them and desire to be more creative. The second ingredient is knowing the residents and shaking up the menu. Unlike restaurants, the culinary team at Garden Plaza has the same clientele every day. This means the cooks have to bring their game face every time they step into the kitchen. Residents have different tastes and come from different backgrounds. The team knows that someone from New York may not want the same thing as the person from Texas. It is important to keep them entertained and keep their trust when serving their food. The menu consists of 60 different meals that cycle every five weeks. Garden Plaza is also made up of about a 40-percent vegetarian population. The culinary team takes this into consideration, and there is always a vegetarian substitute meal available. Building trust is crucial in serving food, and Chef Bradley believes his team sees it through. About 95 percent of the residents order from the featured entrée of the day. Not only do team members bring in new ideas, but residents will bring new dishes to the table too. Residents will bring their cookbooks or an idea they saw from Facebook and request to have it made. The team will then make it, dress it up and serve it. The third ingredient and a proud achievement for Garden Plaza’s culinary team is using clean resources. All beef, chicken and pork are raised grass-fed, and the community purchases from local farms as much as possible. Nothing is previously cooked when residents order their food at any dining hour. When the order is placed, it is cooked to order, meaning it goes straight on the grill or the stove. Soups, salads and sauces are made from scratch and are not store- bought. All ingredients are made by the team, and everything the team cooks is made from scratch. The fourth and final ingredient is to love and care about creating and serving the food. Chef Bradley says food is an art. Cooks have a blank canvas, and they can turn their creation into a masterpiece. That is the beauty of what the team does every day. Its motto is setting the bar higher each day and creating something no one has created before. Repeating a dish is not an option, and encouragement and teamwork will always be provided. So now you know the secret behind the kitchen doors. It takes everyone from each portion of the kitchen to make this dining experience great. The environment is not routine, and the freedom to be artistic is what encourages the staff even more. According to Chef Bradley, the most rewarding satisfaction he has is seeing his team thrive and make a difference for the residents. Knowing that what you created makes a resident happy and is good for them makes it all worthwhile.